Hey Everyone! Today I thought I'd do a post sharing with you all my favorite festive films. Christmas is a time of year where you can get nice and cosy with a mug of hot chocolate and put on a really festive film. It's also the perfect thing to have on in the background as you wrap Christmas presents as well. It just makes everything a lot more festive so here's a selection of my favorite films, some of which have already been watched more than enough times already this year. Oops. Anyway, enjoy! Who doesn't love a bit of Tom Hanks? This is by far one of my favorite Christmas films of all time however, the only time I watch it is on Christmas Eve as it's a little tradition we have in my house to put all our presents under the tree, drink cinnamon hot chocolate and then sit down and watch this film together as a family. It really is one of the most special times of the year and I am so excited to watch this. It is one of those films that does leave you feeling a bit teary eyed as it really is beautiful. My all time favorite Christmas film. Jude Law, Kate Winslet, Jack Black and Cameron Diaz. Such a feel good Christmas film that I'm sure everyone has seen so I won't ramble on about it too much. If anyone is willing to house swap (preferable places are New York or Australia) then please let me know haha! Kate Winslet's character literally reminds me of myself so much as well. I just love it. Is there anyone in the world who does not like this film? With an all star cast including Colin Firth, Kiera Knightly, Hugh Grant AND Liam Neeson this film is one of my favorite ever films. It's such a feel good romantic film following different love stories around the Christmas period. Definitely going to watch this once I've written this post! It is making me a little teary eyed as well however this year since Alan Rickman sadly passed away this year as well. It's still one of the cutest films ever! This was one of my favorite films of all time growing up. I have to include it as it's still a guilty please every so often to put it on and watch it. I just love it. I mean she's a six year old who lives in New York at the Plaza Hotel and has Julie Andrews as her Grandmother? Is it just me or does she have the best life ever. This film is one of my favorites as it just brings back so many memories of my childhood. I just absolutely love everything about this film. It's quite sad yet so beautiful and so incredibly moving and really does show you the true meaning of Christmas. My favorite version is Jim Carrey's which is actually on Netflix so if you're looking for a good Christmas film I'd highly recommend it. I tend to watch this film every year on Christmas Eve. Once you watch it you'll know why! So there are just a short little post about all my favorite Christmas films. I gotta admit that writing this post has definitely made me want to watch them all in a row now. Also how cute is the image that I've used for this post? 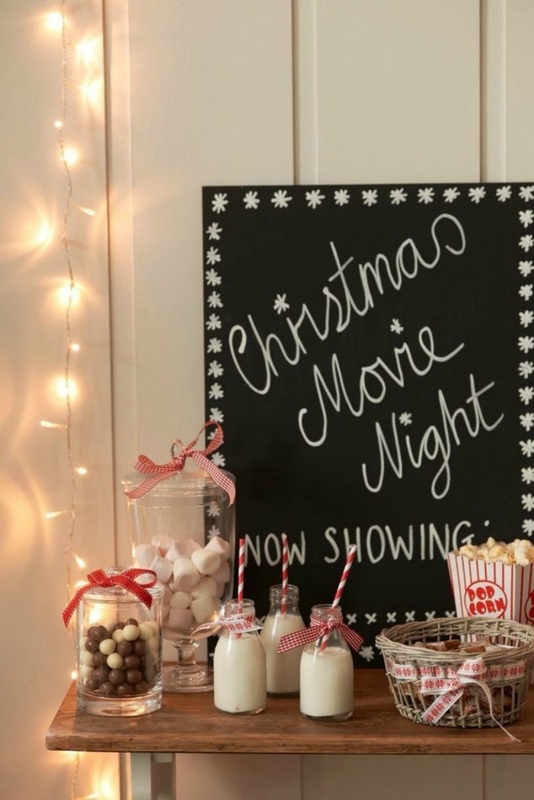 I got this off pinterest and I just think it's the perfect inspiration if you want to have a little movie night with your friends and family so I had to include it in this post. If you haven't checked any of these films out then definitely give them ago. They are guaranteed to put you in the festive spirit and mood. What are your favorite festive films?